At ACCESS Youth, the power of conversation is brought to light. Executive director Jodi Ovca remembers a teenager who hit a man over the head. No reason. He just... bonked the guy. During a mediation facilitated by ACCESS Youth, the man learned the teen’s father had been deported, and that the boy didn’t know how to channel his anger. The man, who was a painter, offered to help the boy learn to paint. Of course, not all the stories end this neatly, but ACCESS Youth’s pro-meditation approach to intervention is part of a growing effort to end the school-to-prison pipeline. Since its founding in 2009, the program has focused on three intervention points: Truancy, alternatives to suspension, and alternatives to prosecution. ACCESS Youth uses mediation to help at-risk youth form solutions to the behavior that might be leading them down the path toward to the criminal justice system. The ACCESS Youth programs are in a state of evolution. In the next year, the ACCESS staff is hoping to extend the programs in existing schools and expand the reach within Wards 7 and 8. 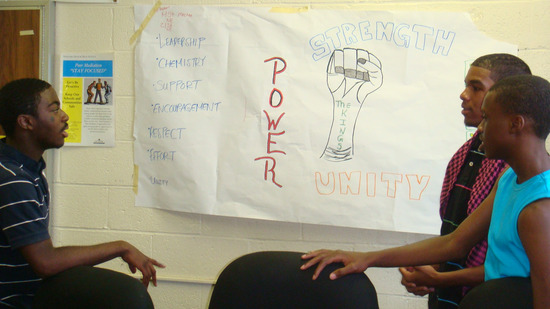 ACCESS Youth has implemented District of Columbia Public School-sanctioned programs at H.D. Woodson and Ballou high schools, with a Memorandum of Understanding through 2017, and has formed a partnership with the ACE diversion program. Last year, Ellsworth said, they were referred a memorable case from the ACE (alternative to court experience) program: A 12-year-old boy arrested for shoplifting candy – about $40 worth. ACCESS facilitated a victim-offender mediation between the boy, his mother, and the store manager. The manager talked about how he woke up at 3 a.m. to start his day early enough to go to the session. He reminded the boy that his mother had had a long day as well, and that people were there because they want to see him make good choices. The child didn't have male role models in his life, and the store manager told the boy that if he were ever interested, he would make sure he got a job at the store. "We had very little we needed to say because the victim was so passionate about making the boy understand the track he was putting himself on,” Caitlin said. "We can get everyone to the table, but sometimes they can forget we're there."